Description: The 9165 is on the point of this six unit lash-up departing John Sevier Yard in Knoxville. Description: H 11 rolls through downtown Waverly, and will take the switch to the connector that leads to the ex LV and Sayre. 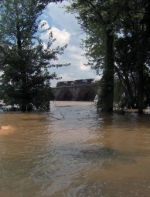 Description: The Susquehanna River cresting at nearly 20 feet as two Norfolk Southern Dash 9s are pulling a coil train eastbound across the Rockville Bridge. Description: A pair of swans, in the flooded Susquehanna River as two Norfolk Southern Dash 9s are pulling a coil train eastbound, across the Rockville Bridge. Description: NS 35Q eastbound on the NS B-line as it approaches the siding at Woods. Description: NS 9165 leads a sister unit with the eastbound Triple Crown train past the Cresson Railfan park on a humid afternoon. Description: 33A comes through CP Tulp with an SD70M-2 on the point. Description: NS trailer/Stack train rolls through Delta. Description: Led by C40-9W #9165 and ex-CR C40-8W #8359, this NS intermodal train heads east beneath the vintage PC-era signal bridges at CP 502/503 on the ex-CR/NYC Chicago Line at Indiana Harbor. Description: NS D9-40CWs 9165 & 9374 lead an eastbound stack train. Description: NS D9-40CWs 9165 & 9374 power an eastbound stack train. Description: A 97-car long train 212 passes through South Plainfield NJ on its way to Croxton Yard.